Injection molded magnets are essentially fully dense magnetic powders blended with a variety of polymer base materials. Depending on the combination of magnetic material and polymer selected, a wide range of final material properties are possible. Selecting the right combination will impact the resistance of the product to moisture absorption, physical strength, magnetic properties, and even maximum operating temperature. Injection molded magnets can be formed from very simple shapes to very complex shapes. Depending on the magnetic material, the parts may require magnetic orientation during the injection molding process to optimize the magnetic properties. Maximum use temperature is a function of both the magnetic alloy powder and of the binder. 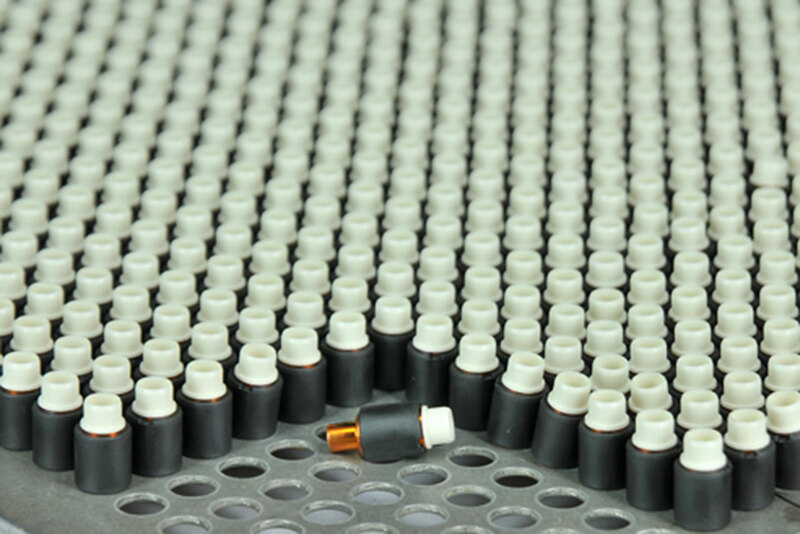 For example, ferrite powders in nylon 6 or PPS have tested satisfactorily at 180°C. On the other hand, nylon 12 melts above 170°C and is not recommended for use above 150°C. Magnetic material such as the highest energy NdFeB grade, with intrinsic coercivity of 9,500 Oersteds (760 kA/m), suffers significant irreversible magnetic loss above 120°C, regardless of which binder is used. Maximum use temperatures are listed on each product’s specification sheet. An important characteristic of injection molded magnets is that they conform dimensionally to the mold cavity which is precisely machined, the result being close tolerances in the finished product. What little dimensional variability there is results from shrinkage of the polymer during cooling. This depends upon part thickness and shape. Typical tolerances are +/-0.003 in/in. Closer tolerances on critical dimensions can be negotiated.